Specialty: What else? Candy canes! If you like candy canes, then there’s no place to be at Christmas time than at Disneyland because it’s only then that the candy confection creators on Main Street (and their partners at Trolley Treats in Disney California Adventure) make these heavenly concoctions. 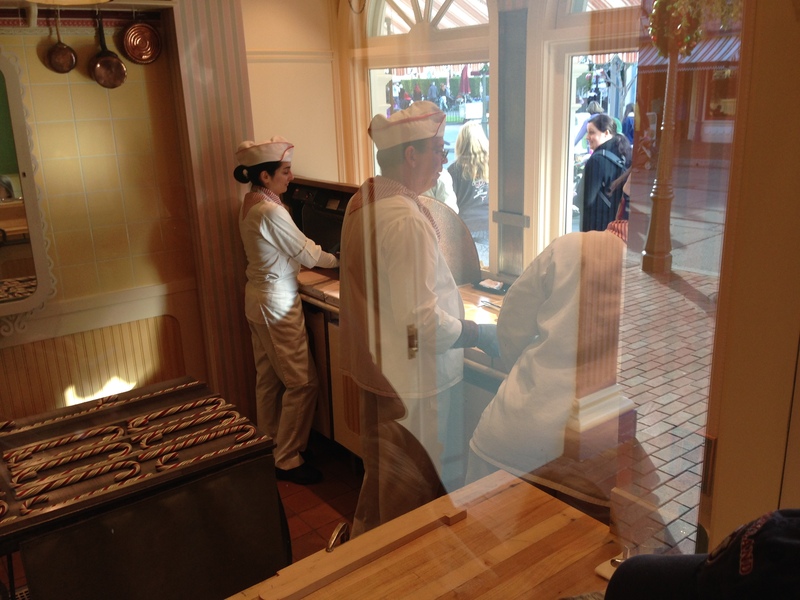 Out of the thousands of visitors to Disneyland resort every day, only 120 get a candy cane and it’s only one per guest, so if you want extra bring a friend and hope they don’t want it too. These tasty treats are worth every penny of the $12.99 they cost. They are huge and delicious. The candy canes have a nice peppermint smell, but not overwhelming. The balance between the mint and the sugar is wonderful. And there’s nothing like having a fresh candy cane (as opposed to one that’s made weeks in advance and shipped all over the country). But because they are so few and only made during this one season leading up to Christmas, you need to be there early. Like “first thing when they open” early. 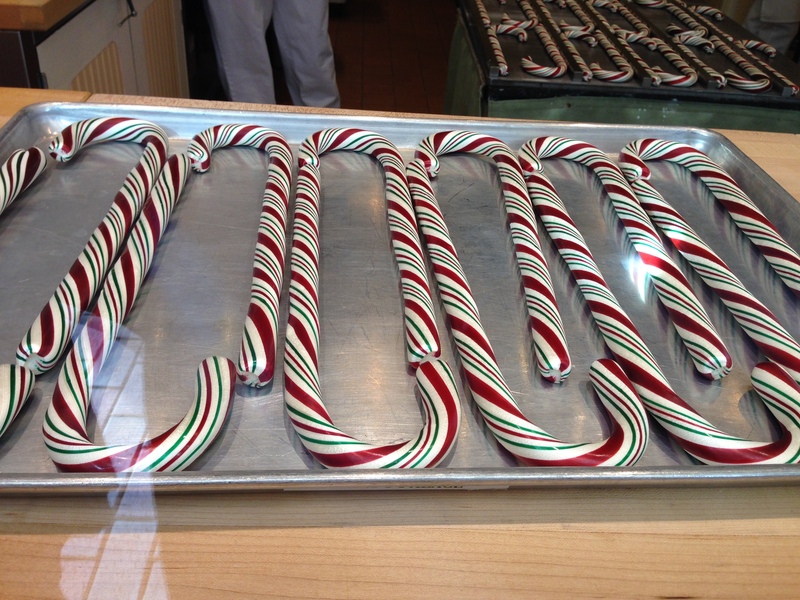 The delicious candy canes as they lay out to cool. Don’t fool yourself. They will run out and very quickly. I got to the park at 15 minutes past opening and was the last one to receive a wristband. Yes, a wristband. You get a wristband to prove you were in line and then you have to surrender the wristband upon purchase. Again, only one per person. You’re given a time to come and collect your rare treat and a “no later than” also (at which point they give it to some lucky person who didn’t get a wristband). While you’re there, you can watch them making each batch. It’s fun to stand at the window as they pull the nearly liquid sugar out and roll it into long tubes until it finally looks like what we are familiar with. It takes three people to make it and the room must be kept at a constant temperature. Too hot and the candy won’t set right and too cool and it will crack. It’s pretty toasty in that room so hats off to the candy makers. Once the candy is rolled, then it’s shaped. It takes a separate person to shape the candy and then place it on cooling trays. After they spend enough time cooling, they get packaged and held in a safe spot behind the counter until your arrival time. Admittedly the price tag is a bit steep. You can buy about four or five packages of the stuff at your local market for the same amount, but they won’t be anywhere near as good or as thick. My daughter and I broke ours up into pieces and it still lasted us two weeks. And each piece was just as good as the last. Tip: Don’t be fooled! There are some $12.99 candy canes on the counter, but those are NOT the freshly made ones! Just because they cost the same doesn’t mean they ARE the same. Read about my experience at Disneyland’s Candlelight Processional on the Disney Nerds blog! I wasn’t able to get to the park in time to get one of these candy canes but reading your post just about made up for it! Thanks for going in to detail about how they’re made, the cost, how early you need to get to the park. I’ve always heard about these candy canes but admittedly I was never excited about them since I’m not the biggest peppermint fan. But I’m sure it must taste good when it’s freshly made. Now, I just have to wait another 11 months for one lol! You can call the Candy Kitchen hotline at (714) 781-0112 for an update on what’s being prepared. It’s not quite candy cane season so they aren’t out yet, but they are a treat! Glad you’re reading the blog! Craig, thanks for info, I don’t mean to sound stupid, but what is the procedure to get the candy cane, where do you get the wrist band? At the main gate? I assume you need to be there when the gates open? You don’t sound stupid at all. 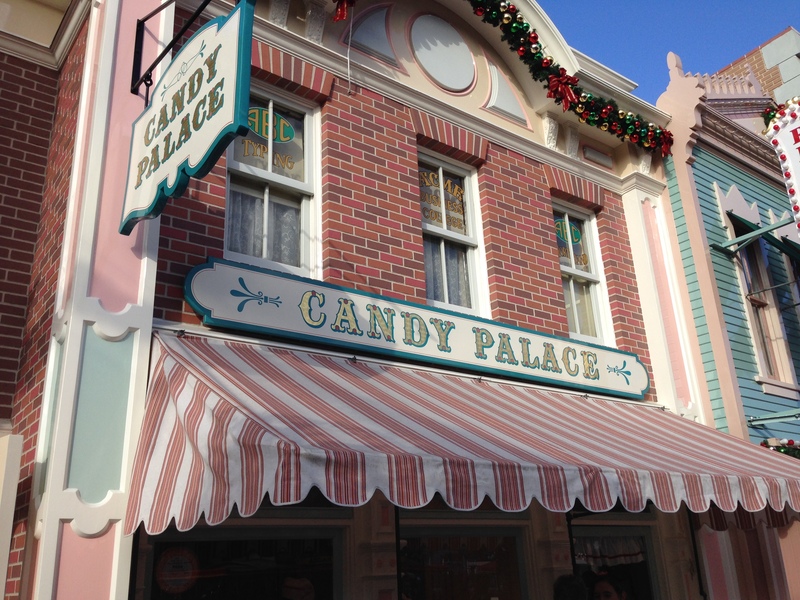 You literally get the wristband at the candy shop it’s being made at that morning (Candy Palace for Disneyland and Trolley Treats for DCA). You definitely should be there when the gates open and head directly for the candy store. Maybe I’ll see you there!